Give yourself or someone you love a special treat. You will relax on a warm Amethyst Bio-Mat during your spa service. The Bio-Mat is layered with amethyst crystals, the universally accepted healing crystal. In addition, the Bio-Mat emits negative ions and natural infrared rays and is FDA approved for the temporary relief of minor aches and pains. Our facials and Reiki sessions are unique in many ways. Your journey begins with the sounds of a Tibetan singing bowl. As your mind begins to drift, the air is filled with the most wonderful aromas, as you experience the ultimate in pampering and relaxation. We customize your facial experience with pure essential oils, organic ingredients, and a holistic approach to healthy skin. Our facials feature Reiki Natural, a Reiki-infused handmade holistic skin care line. 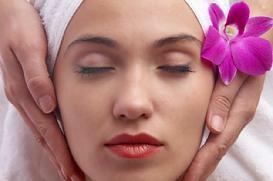 You will love the way your skin glows after a Reiki Natural facial. Reiki Energy Therapy ("Reiki") is an easy and proven method for stress reduction. 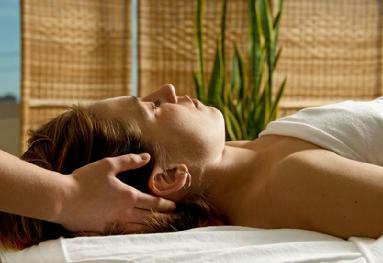 It is a hands-on treatment using energy to promote blissful relaxation. Reiki also unblocks stagnant energy in the body. During the session, the practitioner's hands are placed over the receiver's body in a series of hand positions. We are open for appointments Saturdays and Sundays, 1:00 p.m. to 5:30 p.m. Gift certificates are available for women, men, and teenagers. Make your appointment today by calling our office at 949.460.9669, or emailing us at info@mountolympuswellness.com. Full-European Facial features deep pore cleansing, seaweed exfoliation, and purifying clay mask of the face and neck; light facial massage; ultra hydrating treatment; and high-frequency. Mount Olympus Signature Facial features an aromatherapy scalp treatment, deep pore cleansing, seaweed exfoliation, and purifying clay mask of the face and neck; light facial massage; ultra hydrating treatment; high-frequency; lip treatment; hot oil hand treatment; and warm towel foot treatment. 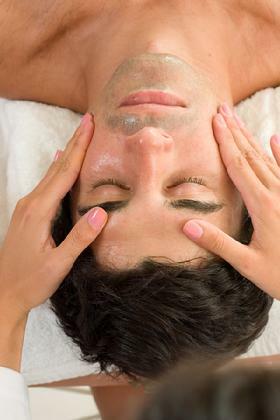 Reiki Facial incorporates Reiki Energy Therapy (a very relaxing hands-on modality) and also features an aromatherapy scalp treatment, deep pore cleansing, seaweed exfoliation, and purifying clay mask of the face and neck; light facial massage; ultra hydrating treatment; high-frequency; lip treatment; hot oil hand treatment; and warm towel foot treatment. Mini Facial features deep pore cleansing and seaweed exfoliation of the face and neck; light facial massage; and ultra hydrating treatment. Back Aromatherapy Facial features deep poor cleansing, seaweed exfoliation, and purifying clay mask of the back; and high-frequency. Reiki Energy Therapy involves transmitting energy through the hands. It is performed by placing the hands in a series of hand positions over the body of the person receiving the treatment. Reiki is a proven method for stress reduction and improving overall health. Aroma-Reiki features "Integrated Reiki" and your enjoyment of soothing aromas (derived from pure and natural essential oils) and the sounds of singing bowls throughout the Reiki Stress Reduction session. Scalp Treatment features a custom-blended aromatherapy treatment on your scalp. Hand Treatment features a custom-blended aromatherapy treatment on your hands and arms. Foot Treatment features a hot towel treatment on your feet. For your first visit, please be prepared to fill out the client consultation card. In the event that you must cancel your appointment, we kindly ask that you give our office a 24-hour notice. To maintain our serene environment, we request that all cell phones and pagers be silenced. Please be on time for your appointment in order to obtain the full benefits of your appointment. Thank you for your consideration.